The annual ProLight + Sound / Musikmesse show in Frankfurt will give Alcons Audio the opportunity to introduce and demonstrate its latest products. 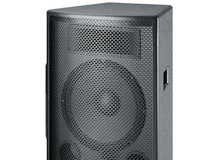 Part of the EV-Innovation (EV-I) loudspeaker family, the EVF Series of two-way, front-loaded, full-range systems is available with 12” or 15” woofers, several coverage patterns, and it includes low-frequency systems. Danley Sound Labs has introduced its new SH-64 loudspeaker. Eurosys Peavey is back on the pro audio scene. Peavey has introduced its new UL10 speakers. KV2 Audio has announced the introduction of 14 new products at this month's Musikmesse/ProLight & Sound. The CADIS system, the new Installation Array from HK AUDIO, was designed for installations in theatres, civic and community centers, houses of worship, gymnasiums, conference centers and large meeting halls, as well as outdoor installation projects such as stadiums and theme parks.